The Sun/Moon conjunction celebrates the onset of Summer five days after the Solstice. Retrograde Neptune in Pisces sends a strong trine to the NewMoon, reminding us all that the root causes of this summer's developments were first sown into the dreamtime while we were still waiting for the Equinox last winter. If things aren't working out as originally envisioned, try thinking back to examine whether there were any fears or trepidations inhibiting your vision at the time. This will help to clear up any erroneous expectations and projections going forward. Venus at 4+ Gemini serves as a mediator between these two watery powers, casting the fierce Light of Nature into our Neptunian fantasies, and subtly nudging the NewMoon to benefit from the lesson being revealed as a result. In the sign of Gemini, Venus can help us outgrow our monocular thinking and open our minds to the fact that we still host thought-forms that work against us. Saturn is testing us through his retrograde in Scorpio. How well does our calculated optimism hold up under stress? The only cure for unconsciousness is consciousness, so this is a great month to surrender to WHAT IS and stop trying to project how we think things "should be". The ongoing Uranus/Pluto square that has dominated thi year so far is a little bit stretched right now, existing in a condition called "out of aspect". This is because Pluto's retrograde has him malingering in the 12th degree of Capricorn, while Uranus has now slipped into the 16th degree of Aries. The focus shifts to Mars who has recovered his foreword stride and is now just leaving an opposition with Uranus that is still nearly exact. This represents a blast of pressure on Aries and Libra individuals to work out our "us versus them" issues. Those who can resist being divided-and-conquered by circumstantial pressures are encouraged to revert to the natural human state, with both hands of the collective body (or both sides of the individual brain) working in cooperation. Retaining our undivided whole-mindedness allows us to focus more energy on finding solutions and work-arounds to current setbacks. Once we have our objectivity back, we'll see that the challenges much have more to do with the unexamined manipulations of a top-down command and control system (Pluto retrograde in Capricorn), than with any falsely contrived difference the the system exaggerates to drive a wedge between right-hand versus left-hand approaches (Uranus opposed Mars along the Aries/Libra axis). 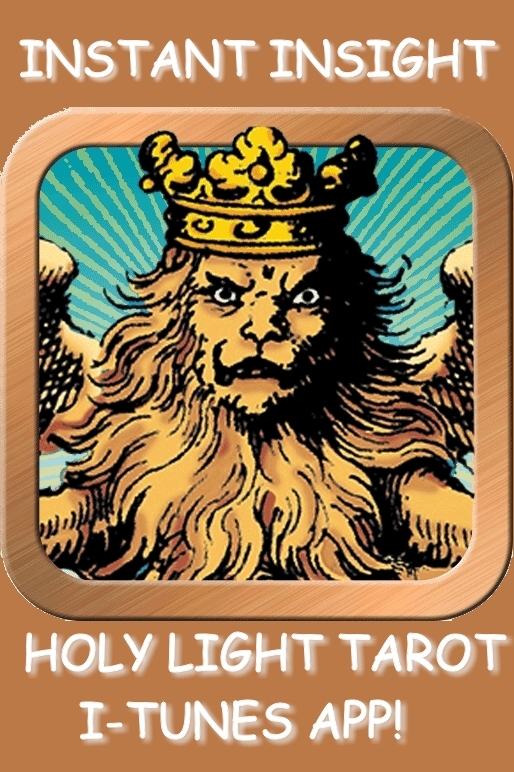 our Tarot of the Holy Light or with any other antique Tarot, you can use this printout as a worksheet. Just write your birthchart planets in a dark or felt-tip pen into the open areas directly inside the large outer Zodiac circle, between the points of the elemental stars. These represent permanent placements that you will use to measure each month's changing NewMoon charts against. Then copy the above NewMoon planetary positions around the outermost ring of the design, using a lighter hand or finer stylus, to show current events in the heavens. This should clearly reveal the ways the current NewMoon placements touch into your birthchart, as well as showing which cards in your Tarot pack are being highlighted under the current astral conditions. If the process seems confusing, you can look back over the last two years of ArkLetters and see how I have projected the NewMoon charts into the Icon from one month to the next. This is the way I train my students, so they can handle astrology and Tarot together as a simultaneous supercharged oraclular matrix. 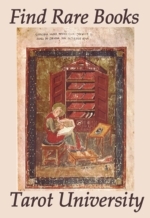 Our upcoming book, Tarot of the Holy Light; Foundations of the Continental Tarot Tradition, will make a thorough explanation of the manner in which the traditional Tarots support the oracular and computational needs of a magus working in the European style. It makes no difference whether the user hails from the Renaissance, Reformation, Enlightenment, Victorian, Modern or Post-Modern eras -- any user of any Tarot from the first 500 years of Tarot's history will understand their deck better once they have been exposed to this overview. All of the techniques, approaches, and philosophies we present were already long established at the dawn of the 1600's. This is the era when the over-arching esoteric synthesis I am demonstrating was revealed in its fullness by Jacob Boehme, a visionary cobbler from Protestant Goerlitz (in the Bohemian region of modern Germany). Boehme's radical restatement of the Old and New Testament drama had such an impact on the Lodges movement of Europe that both the Rosicrucian literature and the Masonic Orders took on an essentially Boehmian cast that lingers to this day. I look forward to sharing this multidimensional esoteric synthesis that appears to have traveled with the Tarot since its occult outline and supple, recombinant nature first captured the imaginations of the card-playing gentry of Italy and France. The Present NewMoon is at 5+ Cancer on Friday June 27th, at 4:10 AM (EDT) / 1:10 AM (PDT). From this moment, the Moon begins to wax, or increase. 2nd Quarter, Waxing Half Moon is at 13+ Libra on Saturday, July 5th, at 8:00 AM (EDT) / 5:00 AM (PDT). Full Moon is at 20+ Capricorn on Saturday July 12th, at 7:26 AM (EDT) / 4:26 AM (PDT). From this moment, the Moon begins to wane, or decrease. 4th Quarter, Waning Half Moon is at 26+ Aries on Friday July 18th at 10:09 PM (EDT) / 7:09 PM (PDT). Next NewMoon at 3+ Leo on Saturday, July 26th at 6:43 PM (EDT) / 3:43 PM (PDT). From this moment, the Moon begins to wax, or increase.